Jacob Kilthau (Kühltau, Kiltow, Kildow) was born June 1859 in Norka, Russia. He is likely the son of Heinrich Külthau (born 1826) and Elisabeth Repp (born 1828). About 1884, Jacob married Katharina Schiebelhut (Schippelhut) who was born October 1, 1862 in Norka. Jacob and Katie immigrated to the United States in 1887 and initially settled in Nebraska where sons Henry George (February 7, 1887) and Jacob James (February 26, 1889) were born. 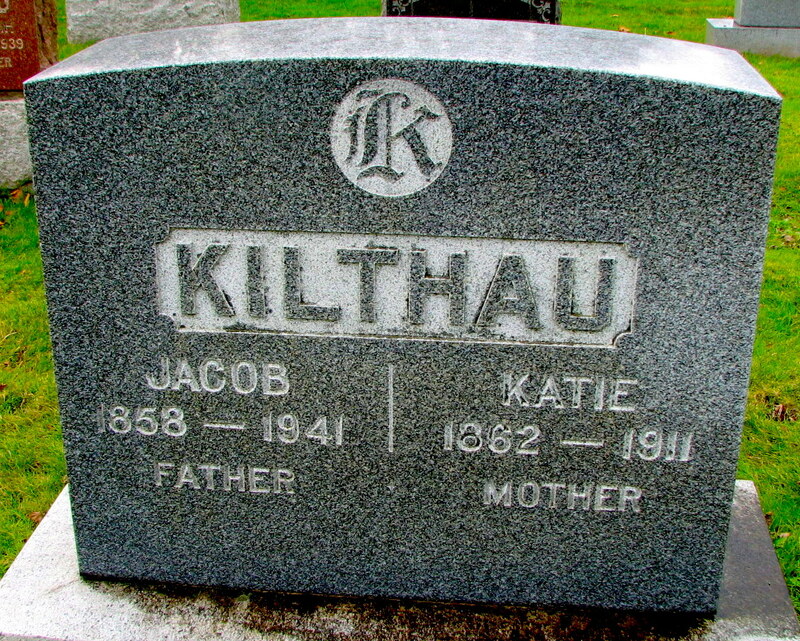 By 1892, Jacob and Katharina (Katie) were living in Portland. The following children were born in Portland: Joseph Carl (October 11, 1893), Mary Catharine (November 30, 1895), Leah (January 19, 1897), Rachel (born July 20, 1900), Susanna (born October 2, 1901), and Emma Jane (born May 18, 1903). Jacob and Katie were members of the Ebenezer German Congregational Church founded in 1892. In 1900, Jacob was working as a blacksmith. The 1910 census shows the family living at 489 Roselawn in northeast Portland. Jacob is working as a blacksmith for the railroad. Katie died on August 20, 1911 and is buried at the Rose City Cemetery in Portland. Jacob died on May 9, 1941 and is buried with his wife at the Rose City Cemetery.